Life seems to be moving so fast at the moment that blogging has taken a little bit of a back seat. To give you a wee update, I start a new job in the morning! Once everything settles down, I'm hoping to get back into more regular posts - plus I have a few events coming up in the next few weeks so that's something I'm looking forward to. Blessed with a rare free weekend, I had a lovely day with Chris yesterday. We got up late, took these obligatory photos (poor, long-suffering Chris...) and mooched into town for an afternoon of overindulgent food, drinks and record shopping. Check out my Instagram feed to see what I ate, drank and purchased! 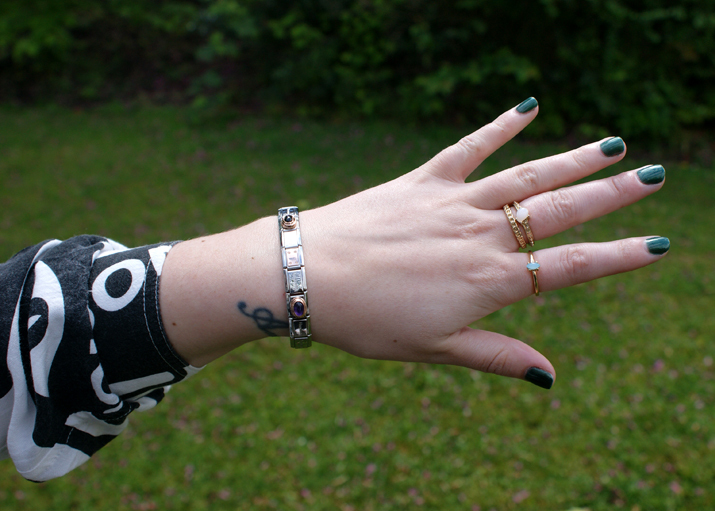 I was recently given the opportunity to try a charm bracelet by Nomination from Argento Jewellery, which has not been off my wrist since I received it. Truthfully, I've never really been a bracelet person, nor am I particularly a fan of typical charm bracelets (looking at you, Pandora...). However, I have so fallen in love with this one! These bracelets are quite unique in the sense that, usually (to me, anyway), charm bracelets bring to mind dangling charms or the overdone Pandora-style types. Nomination bracelets are basically a series of silver links which are stretchy, like watch straps sometimes are, and each 'link' has the potential to be a charm. Someone pointed out to me that the idea is that when you have swapped enough links with charms to fill the bracelet, you're left with enough spare links for a whole new bracelet, which you could maybe give to someone else - I thought that was a really lovely idea. Argento recently launched the Nomination 'Rose Gold' collection and asked me to choose three of these charms to create my bracelet. 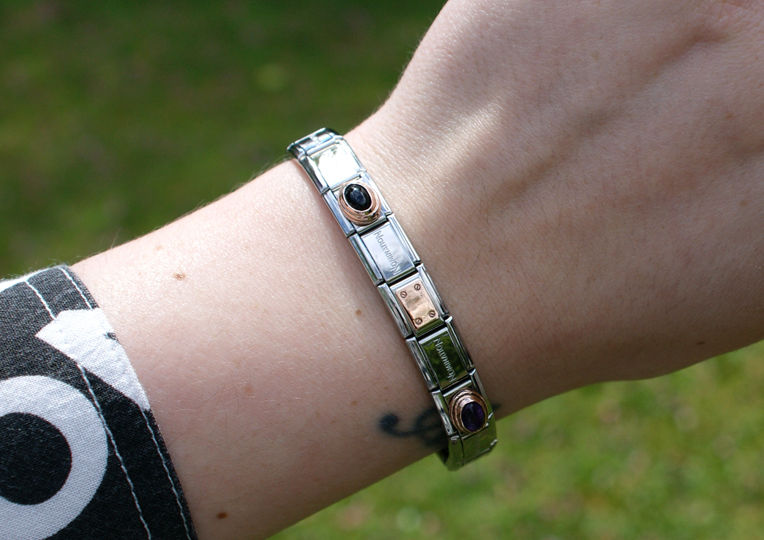 I went for quite a simple rose gold 'plate' charm, with two of the beautiful stone charms - 'Black Agate' and 'Amethyst'. I must admit, I struggled a lot putting the bracelet together. Even after watching a ton of YouTube tutorials, I still found the whole process fiddly and pretty bloody difficult tbh. I was however pleased to discover that I must not be the only one, because they also sell this handy little tool for adding and removing charms. I'll definitely be investing in one of these for any new charms I get. The range is huge, with all the charms set in 9ct rose gold, backed on silver stainless steel like the rest of the bracelet. It was hard to choose just three so I can't wait to collect more charms and add to my bracelet. Here's a little shot of the rest of my outfit. I picked up this shirt a few weeks ago and it has fast become a favourite; Lazy Oaf is one of my top brands ever, love love love their stuff! Plus whenever I wear this shirt, I get Alice Cooper's 'Poison' in my head - and that's a pretty awesome song, right? Fab shirt!! I've heard of these bracelets but never really understood how they worked before - love the idea of swapping the links out and making a new bracelet though. The stone charms that you chose are gorgeous!!! Love. What a cute bracelet!! :) Best of luck with the new job.